There is no doubt that the new Israeli government, led by Benyamin Netanyahu, honestly reflects the collective mindset of the Israeli Jewish Zionist society. True, there are Israelis who are averse to racism and fascism, but these are unfortunately very few in numbers and their influence is almost negligible. Indeed, a fleeting glance at the composition of the new Israeli cabinet reveals an extremist coalition of war criminals, pathological liars, racist thugs (both of the Hitlerian and Stalinist styles), and hateful religious maniacs who inhale and exhale hatred 24 hours per day. For those who don’t know him, Benyamin Netanyahu is a pathological liar par excellence. His modus operandi is based on dishonesty, mendacity, prevarication, and deception. Despite his public relations babbling about “peace with our neighbors,” the man is firmly anti-peace, against the creation of a Palestinian state in the West Bank and against equal rights for Jews and non-Jews. He is actually an enthusiastic advocate for Judaizing East Jerusalem by checking Arab demographic growth, demolishing Arab homes and denying Jerusalemites their natural rights to build homes to meet natural growth. This brazenly racist policy is known as “narrowing Arab horizons” and its ultimate goal is to force the Arab inhabitants of Al-Qods, or as many of them as possible, to leave the city and emigrate for good. Netanyahu’s venomous racism is not confined to the Palestinians of the “occupied territories” or the “Shtachem” as the West Bank and Gaza Strip are often referred to in Hebrew. He was quoted on several occasions as demanding that “measures” be taken to prevent Israel’s Palestinian citizens from reaching the 30% threshold. Furthermore, Netanyahu who often invokes the concepts of civility, democracy and western culture, especially when addressing naïve western audiences, actually believes that Israel should embark on a massive campaign of ethnic cleansing against the Palestinians if and when the international community, particularly the US, would tolerate such a scenario. Well, for those who take the word “transfer” lightly, they should know that “transfer” is only a euphemism for genocide. If such is the character of the premier, one can have a clear idea about his lieutenants and ministers from Avigdor Lieberman, to the gurus of Gush Emunim (the settler movement), who are shamelessly demanding that non-Jews in Israel-Palestine be either exterminated, deported or enslaved as water carriers and wood hewers in the service of the master race! And then there is the irredeemably opportunistic war criminal Ehud Barak who insists rather arrogantly that the army that exterminated hundreds of Gaza children with White Phosphorus just two months ago is the most moral army in the world. Netanyahu is not stupid. He realizes that his ideological convictions are too ugly and too fascist to be accepted by the international community, including the US, Israel’s guardian-ally. This is why he is going to mislead the world by blurring and hiding, as much as possible, his government’s fascist nature. He will heavily resort to employing “diversionary tactics” such as “terror,” “Iran,” “anti-Semitism,” and “Hamas” to distract attention away from the fascist and criminal platform of his government. He will shout “Auschwitz, Treblinka, Mauthauzen, Bergen Belsen” whenever Israeli crimes are exposed and criticized. He will claim that Israel will not allow itself to be pushed to the brink Auschwitz whenever Israel is demanded to end its Nazi-like occupation of the Palestinian homeland and allow the Palestinian people the right to independence and self determination. In short, we are talking about a man who lies as often as he breathes a dishonest politician who thinks and smart public relations can be a more effective substitution for an honest peace process based on human rights and international law. This is why, the capitals of the world must not allow themselves to be duped, deceived and cheated by this notorious, cardinal liar. I am, of course, in no way suggesting that the previous Israeli government was less nefarious than the new one. 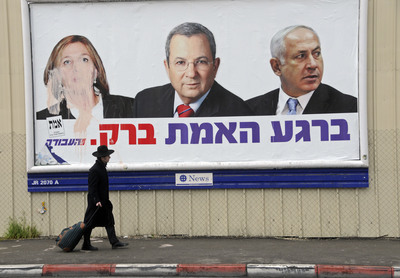 The previous government of the evil trio Olmert, Livni and Barak had all the hallmarks of a Zionist Third Reich. What else can be said of a government that ordered its army to exterminate and incinerate thousands of civilians with White Phosphorus, and then shamelessly claimed that it didn’t really mean to do it? For us Palestinians, and despite the legitimate and understandable anxiety stemming from the rise of fascism in Israel, it is still better to have in Israel a manifestly fascist government pursuing fascist policies than a deceptively “liberal” or “leftist” government pursuing the same criminal policies. Let the world see Israel as it really is. In the final analysis, an honest criminal is better than a lying saint. At least the former is predictable and consistent.